Many people are on Social Media because they are promised huge results – or they see the success stories from others and want a piece of the cake, too. Often when starting out what “results” they are looking for remains vague and many people do not have a clear idea what they want to achieve with their social media activity. The problem with not having a clear opinion on what kind of “results” you are looking for is that, without a clear goal in mind, all activities in social media tend to be unfocused. If that is the case, most of the time you will not get the best results from your social media marketing efforts. Furthermore, you cannot even say afterward if you reached your goals or not and how far you missed them – simply because you did not have any goals. To get the best results from the effort you put into your social media activities, you need to set goals and have a clear idea on how you figure out if you are making any progress to reach your goals. In order to figure out later on if your efforts are getting you any closer to reaching your goals, you will have to define clear goals. When you are starting out, you may be setting very optimistic goals and later on have to readjust them based on your results, your learnings and your newly made experiences. That is not a problem, but you still need goals to start with. Plus if you do not have goals you do not know for certain in which direction to take your marketing efforts. You need goals to figure out if you reached them. You need goals to work towards them. You need goals to measure your progress. You need goals to prove the ROI of your social media marketing efforts. But not every perspective or directive is a goal. Your goals need to be measurable and include a timeframe in which you want to reach them. A goal needs to be measurable in numbers. Your goal needs a number you wish to reach and a time frame in which this number should be achieved. You can have more than one goal. But if you go for multiple goals, you also need to prioritize which of the goals are more important than others. In some cases, you will have to decide which goals to pursue first and which ones to leave behind for the time being. Setting priorities in advance will help you decide which way to take in this situation. While it is important to have overall goals towards which you want to be working, it often makes total sense also to set some smaller goals, intermediate goals or different goals for different social networks. Often people start out with a lot of different activities in social media and while all of them might work towards reaching the overall goals it is very hard to figure out if any of your efforts is getting you any closer to achieving these goals. And even if they help reach the overall goal, some activities may still not be worth the effort. While results in the overall goal may take a while to show, you can use intermediate goals to figure out if you are getting any closer to reaching them. Also, make sure you have goals that really get you somewhere. Doubling your Facebook Fans in three months may be a goal, but it does not necessarily get you closer to achieving anything of value. Be sure why you want Facebook Fans and how you can make them count. In the end your goals should be to achieve something, which actually gets your business moving, for example: Find x new clients in 3 months. If you know how to turn Facebook Fans into buying customers, more fans might be a good intermediate goal, but the overall goal should probably be to get x more customers in 3 months. If your overall goal is to get more sign ups an intermediate goal may be getting more followers; the next can be to get more traffic to a landing page where you have your signup form. Both intermediate goals serve the overall goal – to reach the real goal you also need to succeed in reaching the intermediate goals. Most of the time it takes a considerable amount of time to achieve the overall goal. To keep track of your progress, you should think about other goals which are measurable and necessary to reach before you can reach your overall goal. Getting closer to these goals then is the first step on your way to reaching your overall goal. Think of the intermediate goals as steps on a ladder or staircase: To reach the top (your overall goal) you need to climb all the steps in between. While intermediate goals are good and often very helpful, they are also dangerous. Do not make the mistake of heading for intermediate goals for too long: Getting more followers may be a good intermediate goal, but, in the end, followers do not necessarily give you more business. You need to step onto the next goal in due time. With your goals, you also need to define the Key Performance Indicators or metrics, which can indicate whether you reached your goals or not. You can find some example metrics my recent blogpost “20+ Metrics To Monitor And Optimize YOUR Social Marketing Success“. You need to choose some metrics (or KPI), which can prove if or if not you reached your goals. You need to be able to measure these metrics in a sufficiently accurate way and in a sensible amount of time. Often Social Media marketing tools will provide you with some numbers, your analytics tool will provide you with a ton more. Even the usually provide some analytics as Twitter Analytics or Facebook Insights. If you need other numbers, you will have to figure out how to come by them. Since you now have set some goals, you will be able to determine if you reached them after the set time frame. But what do you do in between? It is not enough to measure if you reached your goals after the time you had to reach them. You want to know if you are on the right track as early on as possible. That means you need to measure your progress all the time. While you will need to allow some time to get things started, you should still monitor the most important numbers right from the start. It is very important to measure your progress on your path to success from the beginning. If you are not making any progress, you need to adapt your efforts, change some things and measure again. Social media marketing does not mean you make one step in the right direction and get where you wanted to get. Most of the time it is a sequence of multiple steps all hopefully adding up to get you closer reaching your goals. If you carefully measure your metrics, you will be able to evaluate your progress – or the lack thereof. Even if your progress is ok and it looks like you will be reaching your goals – watch out carefully for where you may change and optimize something. If you could out perform your original goals and get even further in the set time, why not do it? Most of the time watching one KPI is not enough. While the most important KPI for your goal may be the number of new clients you gained, there can be several numbers to help you figure out if you are getting any closer to converting any clients at all. These may be the number of social media followers, the traffic to your site, the number of sign-ups for your newsletter or something else. In the end, they do not proof if you reached your goal, but they indicate if you are making progress. 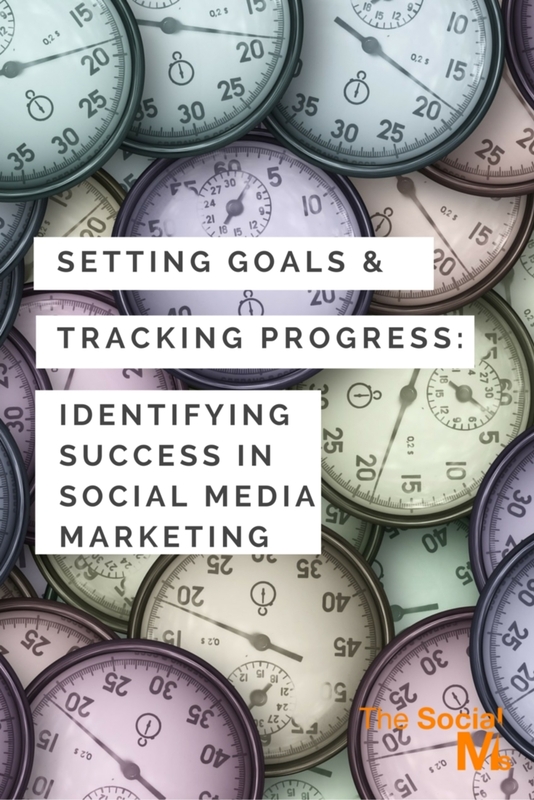 The tricky thing about measuring social media marketing success is that there usually is a long time between starting out and setting your goals and finally reaching them. Most likely in between, you will have to change the strategy multiple times, optimize your processes, try something entirely different or adjust your expectations. And all this will work out better if your decisions are based on measured numbers. To be able to figure out not only if something is not functioning as planned, but also figure out what it is that is going wrong, you need to track carefully your progress, measure how your marketing is developing and make decisions based on the measured numbers. You will need to choose carefully the metrics you watch. Make sure the metric you watch is actually telling you the right thing. Watching traffic does not give you an answer to the revenues you will make; watching social media followers will not tell you if your traffic grows. – Define the time/periods in which you note/measure your metrics (day, weeks, months, hours…). Set a fixed time and date when you will mark the numbers: Ie. every Monday at 3 pm or every day at 6 pm. – Choose a handful of metrics, you want to track. Be sure the selected metrics tell you what you want to know. – Decide how you will measure your chosen metric: What tools do you need? What other numbers will you have to watch to compute the number you need? Once you have decided on these points, think about what the numbers should ideally look like in order for you to reach your goals in the given time. There may be a line between your starting point and your goal, or as in social media more common, the anticipated progress could be a curve, which starts rather slow and picks up speed as your accounts hopefully grow. This idealized development of your metrics will help you to see early on if your actual results and the progress you already made are sufficient to reach your goals. Thus you can identify if your progress is much slower than you hoped for and decide if you should change something in your marketing. Do not go flying blind in Social Media Marketing. Setting goals, using metrics and monitoring your progress – adapt your marketing strategy early on if your numbers tell you that something is not going as planned or anticipated. Metrics can help you identify flaws in your process and give you ideas where to optimize. Understanding metrics and being able to interpret them will help you get your social media marketing right on track. Goals are important. But they can also be very frustrating: When you see the time pass and you are not getting any closer to reaching your goals. I’ve been there. I have struggled to meet important goals when nothing we tried in marketing ever worked as we thought it would. Until we finally found a gold mine. A process that you can follow step-by-step and see your numbers (followers, traffic, leads, customers) grow. Do you want to drive traffic and generate leads from social media? 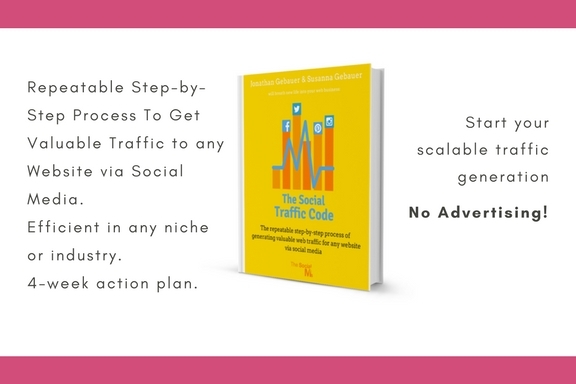 We show you how to crack “The Social Traffic Code” and use this traffic for your business.